Judy Lewis is an assistant professor of Music Teaching & Learning, and director of the new K-12 Contemporary Teaching Practice Master’s degree program at the USC Thornton School of Music. Prior to her appointment at USC, she taught general music in elementary and high schools in the United States and Israel. 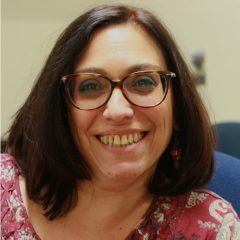 She also served as assistant professor of music education at Queensborough Community College, NYC (2016-2017), senior lecturer in Popular Music Songwriting and Artist Self Promotion & Marketing at the Musrara School of Music & New Media in Jerusalem, Israel (2004-2012), and senior lecturer in Popular Music Performance at the Jerusalem Academy of Music & Dance in Jerusalem, Israel (2007-2012). She holds degrees from Teachers College, Columbia University (EdD in Music & Music Education) and the Jerusalem Academy of Music & Dance (BA and MA in Music Education). Her main research interests lie in the areas of critical pedagogy in music education, popular music listening and composing, and social justice in music education. She is currently a research fellow at the Institute for Urban & Minority Education, Teachers College and a member of the international music education research consortium, Culture, Criticism, and Community supported by the Norwegian Research Council. Her scholarly writings have appeared in Philosophy of Music Education Review, School Music News, and Psychomusicology: Music, Mind, and Brain.